Wash the tamarinds and soak them in 4 cups of hot water for a couple of hours. Rub the tamarinds against each other to get as much pulp as possible. 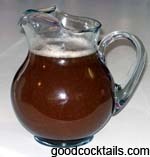 Strain the mixture into a pitcher and dilute with 6 cups of cold water. Add sugar to taste.